Director Robert D. Lemon sits with Lidia Labra, the subject of his documentary, “Transfusión.” Courtesy of Amplified Contrasts. When Robert D. Lemon decided to steer his life towards a career in filmmaking, he realized that many filmmakers didn’t have a lot of knowledge outside the world of film studies. He found that the best directors tend to incorporate other aspects of their life into their art, and Lemon’s debut feature, “Transfusión,” is a striking example of this principle. As a community planner and lecturer at UC Berkeley, with a masters in landscape architecture and currently finishing his PhD in geography, Lemon has a great deal of life experience that richly enhances his perspective on the subjects of this exceptionally insightful documentary. Structured as a series of vignettes, “Transfusión” explores the plight of taco trucks in Columbus, Ohio, investigating both the trucks themselves and the surrounding community. Though the trucks are met with resistance on the city’s West Side, they are embraced in a black neighborhood on the East Side, where the citizens believe its presence will revitalize their district. At the heart of the film is the truck’s owner, Lidia Labra, an undocumented worker who desires to visit her family back in Mexico. Stealing the show is Labra’s hilariously uninhibited father, whose need of a blood transfusion makes his daughter’s return trip home all the more crucial. After it screened at the Chicago Latino Film Festival, Lemon spoke with Indie Outlook about documentary techniques, his love of Werner Herzog and how he hopes his film will lead to important discourse in America. Q: What initially attracted you to filmmaking in general? A: When I was ten years old or so, I had a fascination with video. I talked my parents into buying me a small Hi8 Canon camcorder from some electronics store at the mall around 1991. I can vividly recall the display stands with all these cameras. I became fascinated with the things you could do with a video camera, and I would [record] everything. It came naturally to me to frame things, play with depth of field, and just see the world through the camera. In 7th and 8th grade, I would do the school news and put together short little documentaries of the happenings around the school, highlighting teachers, secretaries, and so forth. I would then spend days editing the footage with dual VCRs, a cheap text machine for superimposing text, a terrible audio mixer, and a CD player. When I wasn’t doing that, I would basically just play with the cameras. I wish I had stories about directing bad home movies, but I don’t. Instead I focused on cinematography and the workings of cameras and editing techniques in the days before non-linear editing. I was running out of things to film and had no ideas in high school for good stories, so I put the video camera down and focused on still photography. I had planned on going to film school for college, but I decided that I wanted to know more about the world. So I went to the University of Texas at Austin where I double majored in History and Geography. I ended up forgetting all about my love for cameras and editing, and my focus became primarily academic. It wasn’t until I was 31 years old that I realized that what I really loved to do in life I had neglected for 14 years. I bought a new HD camera and digital non-linear editing equipment and started playing around with moviemaking. I felt like a kid again and realized my life’s passion was in film. It’s truly the most exciting thing that I do and it comes natural to me—other than lecturing. I still love to teach as well. Q: How did you first become interested in the topic of immigration, and how did you first encounter the taco trucks that form your film’s central focus? A: I was studying at Ohio State University in 2004, and was working on my masters in City and Regional Planning. At the time, I was also working for the City of Columbus and the issue of taco trucks popped up on the radar. I found the trucks intriguing because I had pretty much spent the previous year traveling around Mexico and witnessing all these Mexican trucks sprout up around a city in the midwest was fascinating to me. Over the years, I have continued to study food and cities from an academic [perspective] and decided to write my dissertation about Mexican taco truck vending and the social issues that are associated with food performances. I was really not intending to make a film about immigration policy, that is not my main interest as a human geographer. I am more interested in writing about what food means to people and how food practices are an aspect of identity that can transform the way in which we live in cities. In conveying this message, it is much more powerful to examine extreme food practices, especially when they are associated with migrants’ livelihoods. While writing my dissertation, I have four chapters on four different cities that have traditional taco trucks. I thought that I would make a 15-minute short examining the taco trucks in the four cities. I did a trial run with “¿Tacos or Tacos?” a whimsical film shot in Austin, Texas, that juxtaposes trendier boutique-style food trucks with traditional taco trucks. I then returned to Columbus and was looking for an angle to make a 15-minute short film there. 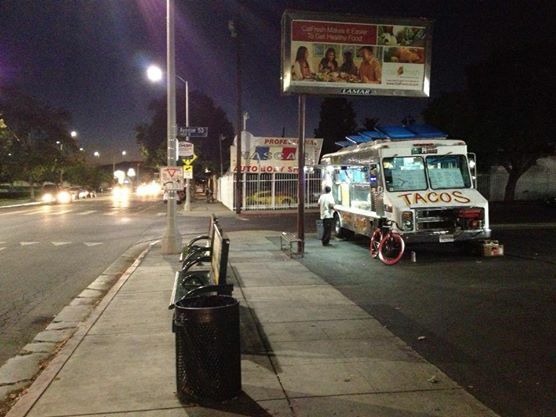 I originally started shooting on the west side where there was much controversy about the manifestation of taco trucks. However, halfway through shooting this story, I came across a taco truck in a black neighborhood. Over the course of filming that truck for an entire week, I got to know Lidia, the owner of the truck, fairly well. I also got to know some of the people in the neighborhood. Then I began to write various ways in which I could turn the material I had into a more in-depth look at the multifaceted realities of the taco trucks. Q: At what point did you decide to structure the film as four short subjects, and how did that impact/enhance the narrative you wanted to convey? A: I am a fan of short film screenings at film festivals. I enjoy watching one short film after another, and [observe how] each takes the viewer on a different journey. I like walking out of the theater feeling like I got to watch several interesting little movies that pulled my brain in a myriad of directions. Moreover, I am also a trained designer and have studied architecture and landscape architecture extensively. I am very fascinated by the repetition of a singular gesture or unit. I am interested in modules, and I already had the idea in my head that my first feature film would be composed of four modules that could be watched in any order but also could be watched consecutively to add up to a feature film. So while I decided to scratch the idea of making four shorts on four cities, I decided that I would focus on Columbus but still keep the concept of the four shorts because the various social issues around the taco trucks were too complex to try to tackle without some sort of simplified structure. However, I had to reconfigure the concept behind the shorts. I decided that I would use the modules to layer the social issues. The four shorts also gave me the freedom to write the shorts as contrasts to each other. It allowed me to examine separate social issues while building each unit into a more dynamic composite. Thus breaking the film down into shorts not only allowed me to tackle different social issues, it also allowed me to change the rhythm, direction, and aesthetics of each part of the film. And because I am now shooting around a cast of similar characters in one city, I could also create character development. So I could easily reintroduce people in a later short, once the audience got to know the characters in an earlier part of the film. I actually would hand draw a series of diagrams to design the shorts, such as who would be the lead character for each short and how I would weave various characters into the remainder of the film. There are actually patterns and beats sketched out that I used to construct the story arc of the film and the character development. I’m not sure if filmmakers traditionally work in such a manner, but as a trained designer, I transferred one process over to another as a way for myself to think, create, and produce. Additionally, to make the feature film function, I created an opening and an epilogue that would bookend the four central shorts. This also proved to be beneficial when teaching. I have an online study guide to the film that focuses on each part of the movie. When I teach my classes or I guest lecture, I will often show one short that fits with my lecture. So the form of the film also is very functional in the classroom. 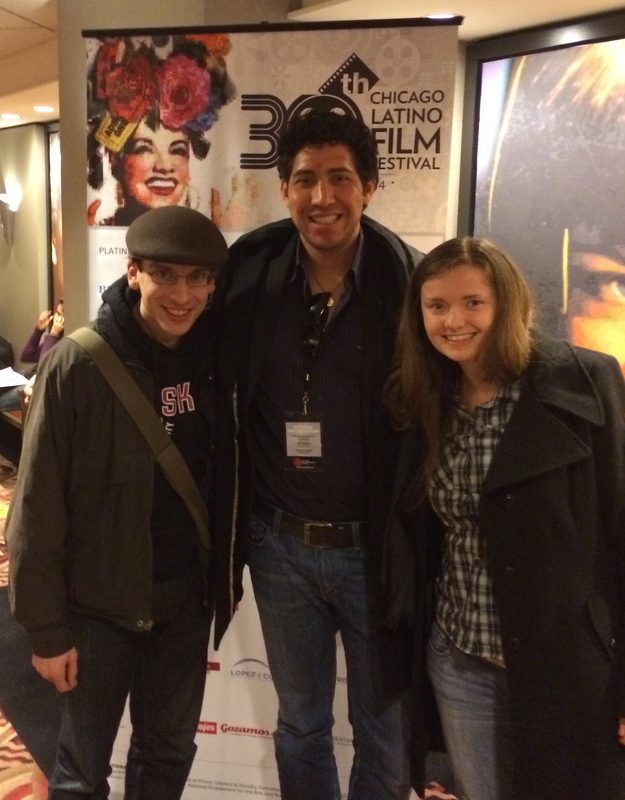 Matt Fagerholm, Robert D. Lemon and April Parker after a screening of “Transfusión” at the Chicago Latino Film Festival. Courtesy of Robert D. Lemon. A: As I briefly mentioned before, I did not intend on making a documentary about immigration policy or make an explicit point to profile non-documented taco truck owners. But as I know from my research, food has significant meaning to people and I believed there could be a dramatic way to tie the two issues together. It was really after I finished filming my first short about the taco truck in the black community that I established a trusting relationship with Lidia. After a week filming around her truck, she got used to me being around everyday and she became comfortable with the camera. I then decided to do a sit down interview with her to talk about issues of immigration and her food practices. After speaking with her, I watched the footage and began to think about some of the aspects of her situation. I thought the film could be more dramatic and in-depth if I could film with her family in her home town in Mexico. So I started writing out storyboards and potential interviews I would need to make another short. During this time I also checked with an immigration lawyer about obtaining papers for Lidia. I really wanted to show the entire process of what one needs to do to get his or her papers. I was shocked when I found out that there is currently no process. Thus I felt the film had come to an end because I did not want to release a film about a woman who was undocumented and expose her. But this fact also made it that more important to tell her story. Here again, I had to rewrite the direction of the film to tackle this dead-end. I realized I would be making Lidia’s story a cliffhanger. Indeed that is the status of so many people who are here working hard, whose lives are in legal and spatial limbo. There are thousands of people in the United States like Lidia, but seldom do people put a human face on the policies that our nation debates on the simple-minded 24 hour news networks. I had to do more research into the law and have an immigration lawyer talk to Lidia about the scenario and what it would mean to her as an undocumented person on film. Ultimately Lidia decided that it was more important to take a stand than to be silent, and if something did happen to her, perhaps now there will be a community that would rally to her cause. In this case, it is better to be known than anonymous. Her risk of deportation is the same regardless if there is a film about her or not. Fortunately so far, the support for Lidia and the film has been overwhelmingly positive. Lidia told me the other day she received a phone call from a woman in Cleveland who said she cried her way through the film at the Cleveland International Film Festival and she wanted to thank Lidia very much for making the movie. Lidia told me this phone call meant a lot to her and she was very happy to have received it. Lidia Labra in Robert D. Lemon’s “Transfusión.” Courtesy of Amplified Contrasts. Q: I loved the moment where you include a split-screen of Lidia preparing a traditional Mexican dish in Ohio and her family making the same meal in Mexico. This “synchronized cooking” sequence beautifully illustrates how certain customs keep estranged families linked over great distances. What does this scene mean to you, and how did you come up with the idea of it? A: I like the idea of dual narratives that cross over. Using the medium of film, I wondered how could one best illustrate two narratives coming together visually. I decided that a split-screen would best portray these sorts of contrasts, especially in narratives that are tied to different spaces and places. On maps we see places as separated through space, onscreen we often only see one frame at a time. But if we see multiple images on the same screen, such as with a split-screen, I believe our mind subconsciously interprets the images to also have spatial separation. Moreover, the idea of food to bring people together when people are physically separated from one another could be made evident through a split screen. Thus having two families doing the exact same thing side by side would illustrate that time and space are compressed through food performances. The academic side of me wanted to show how food brings people together over a vast distance, the filmmaker side of me wanted to convey this visually. 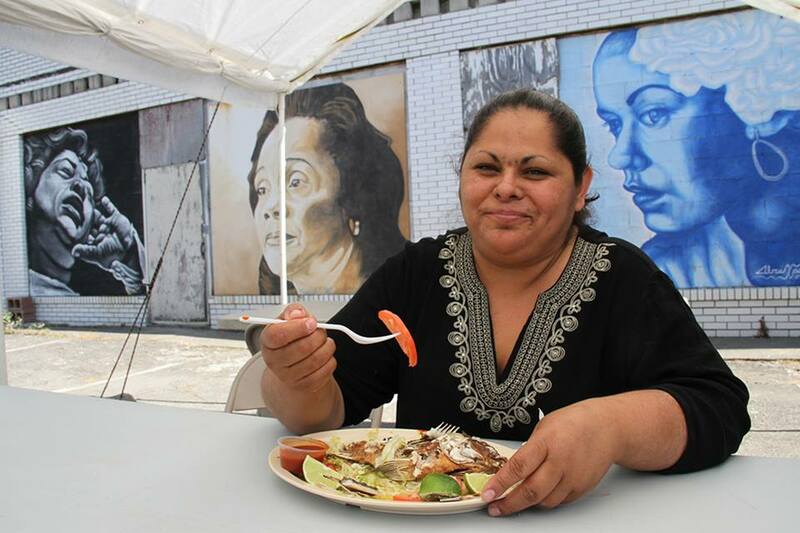 So I wrote a split-screen about Lidia cooking in her taco truck the same meal as her family cooking in Mexico, “tacos rojos potosinos.” At the time, I did not know what the food would be or how it would all unfold, but I wrote the scene and pieced it together. It did not turn out exactly how I had imagined, but it turned out better than I thought. I was really happy that through film I could bring the family together onscreen for a shared moment, and doing this through a cooking scene accentuates the importance of food to people and place. I actually wanted to do more split-screens throughout the film, but I decided that this particular split-screen was so powerful, I was only going to use the technique once in this feature. 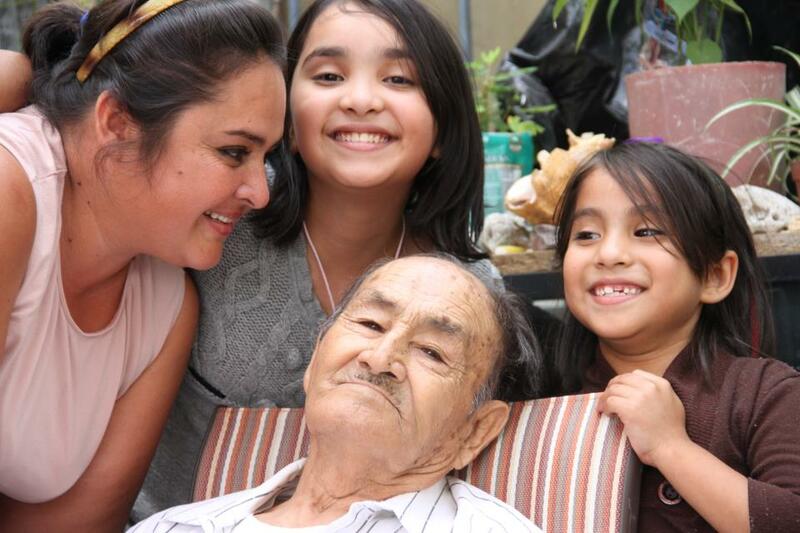 Lidia Labra’s family in Mexico in Robert D. Lemon’s “Transfusión.” Courtesy of Amplified Contrasts. Q: You’ve mentioned that your favorite Werner Herzog film is “Stroszek,” the darkly comic drama about a German man who attempts to build a new life for himself in Wisconsin. Has his work served as an influence on your filmmaking career? A: Werner Herzog is, by far, my favorite documentary filmmaker. I love his work because he is able to capture aspects of space and place through the way he portrays landscape in his films. He is also a genius in the way he captures the human spirit. Moreover, Herzog is a profound thinker. It is apparent that he has read a lot of German philosophy. He wants his audience to think, feel, and imagine with him. He makes narratives with real characters and documentaries with aspects of fantasy. I love this approach to storytelling. I am not interested in watching documentary films that present me a list of facts, or to be persuaded not to eat tuna, or why I should be a vegetarian, or not go to Sea World. While these sorts of films may have their relevance for certain audiences, they miss the bigger and more beautiful aspect of documentary filmmaking, and that is the art and creative expression of the medium. After studying documentaries on my own for some time, I really don’t see documentary filmmaking as being that far removed from narrative filmmaking. I see documentary filmmaking as just another type of storytelling. The story itself may have factual events unfolding before the camera, but it is still a very skewed version of reality. We can never know everything, and documentary films are probably more misleading than narratives because general audiences tend to feel like they are being educated about something in a matter-of-fact sort of way. However, I tend to think that all documentaries are pretty much fiction, and I like to play around with this aspect of documentary filmmaking; the aspect of skewed reality that is brought forward by the director. That being stated, Herzog allows viewers to delve deeper into the issues presented because he creates intellectual points that the audience must be able to connect on their own and from their own perspective. He does not tell his audience how to think. One must discover on his or her own the deeper relevance embedded in his films. I try to do the same thing. “Transfusión” is really not about a blood transfusion, it is about so much more than that. The points are there, but the audience has to dig in to find that story, and to each member in the audience, that deeper message is different and resonates significantly to them on an individual basis. I have had several people come up to me and tell me what they have found profound about the film, and what about the film they have identified with. Each of their messages and emotions about the film are varied, and they are all correct because the film does not tell people how to think, rather it allows people to think for themselves. 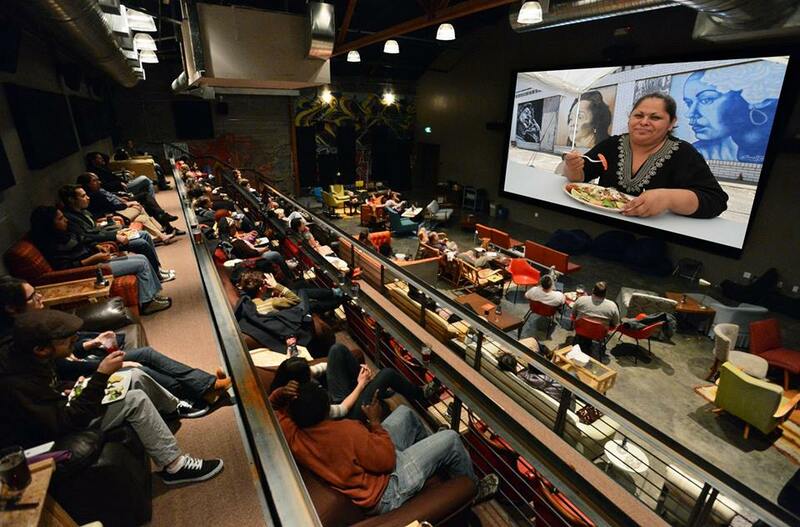 The film is designed to let people watching the film feel that they are part of it. That may also be why the film works better with more intellectual audiences, and that is fine with me as well. I’d rather have a niche following than appeal to large general audiences. If you are going to watch “Transfusión,” or anything else I produce, you have to bring yourself and your mind to the theater. Indeed, I feel like I set “Transfusión” up for people to really get deep into film on several emotional and intellectual levels. People can watch it over and over, and engage with the film in various emotional and intellectual levels each time. Again, I approach documentary filmmaking as an art form. I want the audience to be engaged as well as entertained. I want the audience to think, and be moved by the images I present to them. Thus I try to intensify the scenes in the film by writing most of the scenarios in the story. Of course I am writing around reality and the people in my stories are real people. In this particular documentary, I wanted the film to feel rough around the edges, to be a bit gritty. 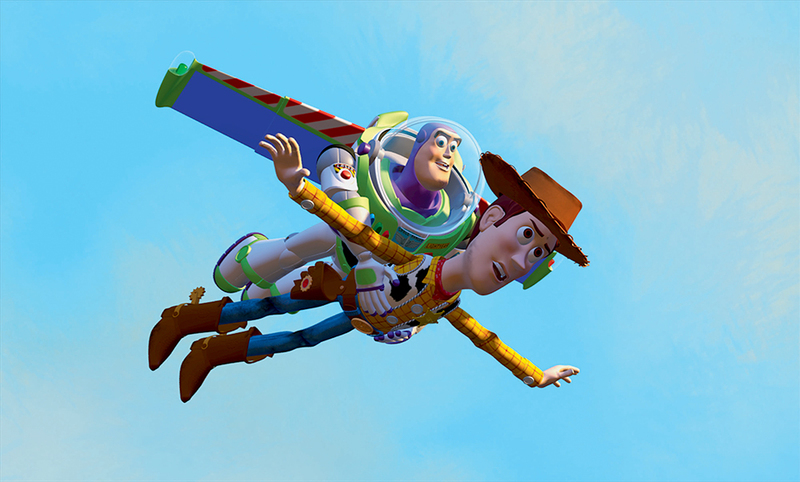 I wanted the film to feel down to earth; more seat-of-the-pants than staged. I indeed knew that capturing raw moments would come with cinematic difficulty. So I tried to incorporate flaws seamlessly rather than fight them while filming or edit them out. Most aspects of this film, no matter how quirky, were consciously sketched out ahead of time or amplified during the production process. There were also several unexpected moments that came forward, but knowing how to approach these shots from a bit more of an open-ended structure allowed for these sorts of moments to sprout. I know this tends to go against the high-end SLR docs that are coming out these days, and that decision was deliberate as well. However, because this film is a social documentary, I did try to be as true as possible to the gravity of the situation of immigration as well as to the social aspects around food. In future documentaries that are not so serious nor designed for educational purposes, I will probably blur the boundaries between fact and fiction as much as possible. Q: One of my favorite things about your film is how you allow certain scenes to breathe, enabling the viewer to feel like they’re sitting across the table from your characters. How did you go about building the film’s rhythm in the editing room? A: Back to Herzog. I had recently watched “Into the Abyss” before shooting my film in 2012. Again, “Into the Abyss” is a film that is more philosophical than what it appears to be on the surface. Herzog captures the human spirit and emotion very well by allowing the camera to just focus on the faces of the characters without them speaking. And in communication, only a small part of it is speech. I also love Dorothea Lange’s photographs and approach to documenting the social conditions that affect the human spirit. She takes photographs of people looking into the camera. The images are haunting and speak volumes without the subject saying a word. So why on video must we always have dialogue? It is after all primarily a visual medium. I try to think of the same approach in my film. I only use speech when it is absolutely necessary. I would rather just show people as they are. In “Into the Abyss,” Herzog leaves long moments of silence over his subjects. It is in these silent, at times awkward, moments that you really connect with the characters and identify with them as human beings. Additionally, it is during these silent moments that you see people thinking and simply being. These moments are where I find beauty. It is the pauses, not the actions, that are essential in holding the human aspect of my film together. In “Into the Abyss,” Herzog allows these silent moments to jump off the screen. I merely tried to do the same. After an interview, or during an interview, I would roll the camera and just let people be. At times they had something more profound they wanted to say. At other times, they smile at the camera or just look into it. I found that during interviews, people just want to be listened to or to be acknowledged. I found that to be very important as well. I take lots of time to do even the shortest of interviews. I’m not interested in sound bites. I am interested in getting the character of the individual to come through onscreen. I will do an hour-and-a-half take just to get a few minutes of footage. If I, as an interviewer, can shut up and just listen, even in moments of silence, then I can often catch something that is powerful. Then in the editing room, I tried to allow these moments to linger, to showcase the silence and accentuate the pauses. With the dinner table scenes, I merely just tried to film people’s interactions. I allowed the film in the editing room to diverge a bit from the main narrative so that the audience could connect on the most elementary human emotional level with the characters. And not just with the dinner table scenes. Throughout the film, I interviewed the most interesting people, and no matter what the person had to say, I really wanted their personality to connect with the audience. That is why I would allow the camera to linger on people, or not edit out certain flaws in grammar or speech. We all as humans have our flaws, and we can identify with that. We can laugh about it. These raw rough moments are what allow us to connect to each other as human beings and interpret the human spirit of others. And this is one of the major points of cinéma vérité filmmaking to me, to connect with people on an emotional level. A taco track in Robert D. Lemon’s “Transfusión.” Courtesy of Amplified Contrasts. Q: What are your ultimate goals to achieve with this film, and what message do you hope to convey to American audiences? A: First off, I hope I have put a face on immigration. I know the film is very controversial and many organizations are hesitant to show it, but for that very reason it needs to be seen. I hate the fact that our American news media concentrates on irrelevant minor talking points. As a nation, we also have a short attention span. I hope by humanizing immigration and presenting it in an informative and entertaining way, perhaps we can have serious discussions about immigration reform. I, for one, was not very knowledgeable at all about immigration policy until making this film. And now that has become my main point of advocacy for this film. I did not plan on making a film about immigration. And while making the film I, for sure, did not want to tell people how to think, but rather, I do want people to try to think. That would be amazing, for people to think critically. As an educator, that’s all really I can ask for. My major point of this film, going into it, was to explore and expose the fundamental social issues associated with food. I’m a bit tired of the food network highlighting boutique food trucks and Anthony Bourdain exploiting exotic food practices for western audiences from a white man’s middle class perspective. Food is much more significant to the social functioning of our society. I wanted to make a film that did not fetishize food, but enlightened audiences to the significant social aspects of food and its importance to people and people’s space within society and their place within the world. Personally, I am trying to transition out of academia and into filmmaking primarily. This is the film to bridge the two; my academic knowledge and filmmaking. Q: Tell me a bit more about the connection that you’ve found between food and the social behavior/urban policy in American cities. A: Food performances are being regulated to various degrees in cities across the country. To scrutinize food practices, especially street food practices of taco trucks, it really boils down to health and public safety. Under public safety, the trucks are no more of a hazard than any other vehicle on the road, and as long as the food trucks meet health inspection, there is really no way to regulate food trucks from a legal point of view. However, cities across the country try to intervene with regulating the trucks. It seems that cities really want to be in control of everything, especially social practices and public behavior. So then, if it is not about the health of the food, or an issue of safety, then it is really about the performance of eating street food itself. It is a cultural perception that somehow gets argued into urban policy and regulations, but it is indeed more of a cultural perception than anything else. At times it is racist, and other times, it is just foreign or misunderstood. But in the last few years, the new boutique food trucks are all the rage and street food all of a sudden has become accepted and celebrated by most cities. Now that food trucks are a middle class thing to do, to go eat at a food truck and “be cool,” then one has to ask: how is this aspect shaping cities, American attitudes, and social behavior? That is pretty much what my dissertation is all about. How is it that an ethnic group of people who for years have struggled to make a living selling street food are now second fiddle to the new food trucks that are taking over many American cities? For some, the food trucks represent diversity and economic opportunity for a city’s corporate image. So I use the food truck as a cultural yard stick to measure economic and social attitudes towards Mexicans and street food in general in cities across the country. A screening of Robert D. Lemon’s “Transfusión.” Courtesy of Amplified Contrasts. Q: Do you have any other projects currently in the pipeline? A: At the moment I am trying to finish up my dissertation, “Taco Truck Transfigurations: The Spatiality of Orderly Disorder.” My dream is to get this published as a book at some point. As far as film goes. I definitely want to do more work. I have a few projects on the back burner that I can’t really say much about yet. Two are feature documentaries and one is a narrative short. The only one that is far enough along in development to speak of is a feature documentary about the art, music and poetry of Vietnam vets. I’m interested in these creative outlets as a way of coping with PTSD. This will be another social issue doc, but I want the visuals, the music, etc to be told by the men who went to battle in probably the United States’ most controversial war. I may start reaching out to veterans in January or February of 2015 and try to start looking for funding then as well. I came about this idea from starting a documentary about my dad and his relationship to the landscapes between growing up in Oklahoma and then going off to war in Vietnam. Surprisingly, I started to receive several random emails, out of the blue, from veterans who caught wind of the project and wanted to submit their music to it. I also had veterans who wanted to read me poems about the war. I realized I had touched a very sensitive nerve. So this most likely will be my next project and I hope to launch it soon. Regardless, I plan to be prolific with film. I hope to produce at least one or two films a year once I’m out of academia completely. I just want to make films that convey my state of mind. If people want to tune into my insanity, then they are welcome to. “Transfusión” will screen at 2pm Saturday, April 19th at the 23rd Arizona International Film Festival, with Lemon in attendance. For tickets, click here. For more info on “Transfusión,” visit the film’s official site and Facebook page. For more info on Lemon, visit his official site.